Here is the Legend of Xishuangbanna Dai nationality: In ancient times, there was a mischievous monster. People hated him and thought that many ways didn’t kill him. After that, the devil grabbed seven girls to be his wife. One day, the wise smallest girl heard his fatal weaknesses from the devil’s mouth. That is to use the devil’s hair to levy his neck in order to put him to death. Then, the smallest girl unplugged his hair and slapped his neck when he sleep, and the devil’s head rolled off. But when the devil’s head fell on the floor the fire ignited; no way, the girl pick up his head and the fire went out. So in order to avoid the burning of the fire, she and other six sisters took turns holding the devil’s head and changing it once a year. People are pouring water on the girl in charge every changing time, washing away the blood from her body; washing away her fatigue for a year; and praying for disasters in the new year. Since then, it has formed the Songkran Festival to send the old and welcome the new. The Songkran Festival is the most solemn festival for the Yi people, and it is also the festival with the most influence and the largest number of participants in yunnan minority. The Songkran Festival is a new calendar year and the festival usually lasts for 3 to 7 days. In the early morning of the festival, the men and women, young and old, put on festive costumes, took the clear water, went to the Buddhist temple to bathe the Buddha. And then began to pour water on each other, wishing each other good luck, happiness, and health. All the people will dance together, and they shouted “Water! Water! Water!” The sound of drums and cymbals rang through the sky, and the blessings splattered everywhere. The scene was truly spectacular. This ordinary day is a meaningful to some ethnic minorities in Kunming. 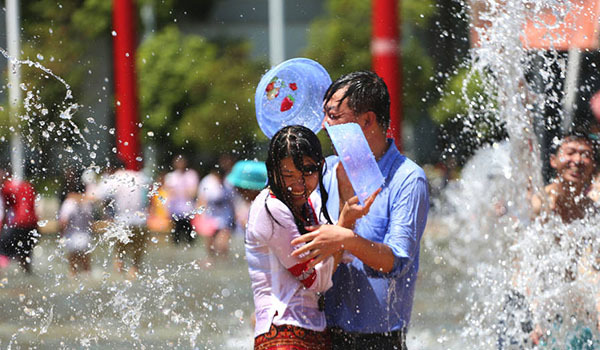 Many tourists and ethnic minorities spend the annual Songkran Festival and enjoy the dripping water.